The Ostroy Report: Can We Trade in Our Republican Senate Clunkers? Republicans: NO! NO! NO! Don't you get it? Whatever you push for, no matter how good it is for the country and for Americans, we're gonna oppose it because it's in our own selfish interests to undermine President Obama, the economy, health care and everything else on the administration's agenda because the 2010 midterms are right around the corner and we want to take back the controls. 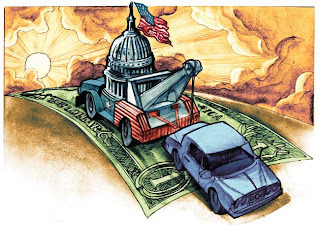 Case in point, the government's "cash for clunkers" recession-busting program, which gives rebates of $3500-$4500 to anyone trading in an old heap for a new, more energy-efficient car. The initiative was such a hit with spending-starved consumers in July that Ford posted its first quarterly profit in two years, and others including GM, Chrysler and Toyota saw significant sales increases over June. Dealers reported selling 250,000 automobiles, a pace not seen since before the recession began. So successful was the program that the government blew through its initial $1-billion budget, and has gone back to Congress to request an additional $2-billion to keep it going. The House approved the measure last week, and now it rests with the highly partisan Senate. So let's analyze this: the government is helping drive (pun intended) consumers to make big-ticket purchases, which in turn is clearly reviving an anemic auto industry, which in turn could result in a ripple-effect throughout Detroit and ultimately create jobs and help aid the nation's financial recovery. Sounds like a perfect, spot-on strategy to inject some much-need life into the ailing economy, right? Well, not if you're a Republican who cares more about getting re-elected and winning back Congress than fixing the economy and helping Americans get back on their feet. The beauty of the cash-for-clunkers program is that it's an inarguable success. It's working exactly as the administration envisioned, and the results are clear, factual and impossible to dispute. But when asked about it, and if they'll support it, Republicans offer up the most lame excuses. Senate Republican Leader Mitch McConnell (KY) on Monday criticized Obama for underestimating the program's popularity because he initially only earmarked $1-billion to fund it. So let's get this straight: Obama screwed up because the program is a huge success! Ya gotta love the Republicans' convoluted logic. Other talking-point criticisms are that while the program's successful, it's "mortgaging our children's future" and/or is taking away critical stimulus money from more worthy programs. But the simple truth is this: Republicans don't give a crap about the unemployed, the uninsured, the economy and making this country financially healthy again. To the contrary, it's in their political best-interest to root for failure. To wish the economy further turmoil, to have greater unemployment, to have Detroit go bankrupt, and to generally just get voters so angry and fed up that they'll vote Republican again. But Americans are starting to get encouraged by all the positive signs in the economy, and that could ultimately make them happy again. And happy will not equate to GOP votes come November 2010. What the cash-for-clunkers program has clearly demonstrated is that there's tremendous pent-up demand among consumers, as evidenced by the record 7% savings rate and the program's success in loosening those purse-strings. While there are indeed millions of Americans unfortunately without jobs and living hand to mouth, there are still plenty of people with money and this program is helping them spend it, which in turn is helping lift the economy. Senate Republicans need to lay down their partisan swords and act responsibly here by passing an additional $2-billion funding measure. They did the same thing for eight years under Clinton. The Democratic Party needs to get together in this historic opportunity to vote things through and move. Great title! Yeah, those GOP clunkers get the worst mileage! Wow - it worked so well, maybe the democrats will start a "Cash for CRT" program where I can turn in my old TV and get that new LCD TV I've been waiting to get! Or, how about "Cash for Commodores," where I can turn in my old PC and get a new Mac? Or, "Cash for Carcinogens," where I turn in my coal stove and buy a new, electric heater? I've got a paid-off car. Yeah, it doesn't get the best milage, but do I really want to go into debt (even if it's a really good deal to go into debt) when I can instead save my money? Never mind, you're right. It's just Republicans poo-pooing a good, not-at-all redistributive policy that benefits the newest government-owned manufacturer. I'm gonna go call my senator now. If you really believe the Fed Gov has the right to steal from all of us then give our money to others for nothing so they can buy shiny new baubles, you; 1) Know nothing about economics; 2) Know nothing about freedom and US history; and 3) Know nothing about world history. I have never read a more ignorant article in my life. You call these clunkers "old heaps," and that's how the word should be defined. A "clunker" is a dilapidated old car or piece of machinery, yet the Cash for Clunkers program only applies to 1984 or newer model vehicles. They're calling new model SUV's "clunkers" -- ridiculous! Why do they even need 1 single GOP vote? The Dems have it all. Just pass it and be done with it. won't be long before they get hemp neckties and tar and feathers. you'll see they'll all get a day of reckoning the likes the nation hasn't ever seen before, due to white hot seething RAGE boiling in the population for being played as voiceless, impotent chumps. you'll see. doodoo is about to hit der rotational aerodynamic wing surfaces, for damned sure! Clunkers? "...it's in their political best-interest to root for failure. To wish the economy further turmoil, to have greater unemployment, to have Detroit go bankrupt, and to generally just get voters so angry and fed up that they'll vote Republican again." I think you just described terrorism. Can we get them declared enemy combatants now?